I had no idea that McDonald’s Happy Meals were gendered, but then I’ve never ordered one before this week. I’ve been suffering from a nasty bronchial thing, which I thought was improving but which then circled back on me. I still had to run some errands, though, and I was hungry, so I pulled into McD’s. I decided that, since I couldn’t taste anything anyway, a Happy Meal would be an inexpensive way to go. I was surprised when the clerk asked me if the meal was for a boy or a girl, but I quickly decided on boy, and as I pulled up, I found out the reason behind the question. It had nothing to do with the meal itself – it was about the toy that came with the meal. In this case, the “boy toy” was a Star Wars Yoda Spinner. I saw that the “girl toy” was something involving My Little Pony. And while the Yoda Spinner turned out to be pretty cool, I was intrigued by the My Little Pony idea and wanted to see what that was all about. So the next day, I stopped at another McDonald’s and ordered another Happy Meal. This time, when the clerk asked, “Boy or girl?” I said, “Girl.” But when I looked in my bag, I was disappointed to discover that this particular McD’s was not giving away My Little Pony items. 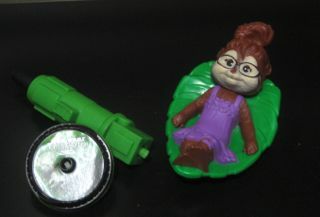 Instead, their “girl toy” was “Jeanette,” a female chipmunk character from the new Alvin and the Chipmunks movie, who spins around in a little plastic leaf bed. I have no idea what the “boy toy” was at this particular location – perhaps a Transformer, because that’s what is advertised on the website. Forcing a gender onto a child’s meal is problematic, and not just for trans kids. There are probably quite a few non-trans boys who might want a My Little Pony and non-trans girls who might want a Star Wars Yoda Spinner. If you just saw the Alvin and the Chipmunks movie, you might want a chipmunk toy, regardless of the character’s gender or your own. If you just saw the Green Lantern movie, you might want a Green Lantern toy. But you might be afraid or embarrassed to say so – especially when the toy is intended for someone not of your gender, made very clear by the question that is asked. Don’t make kids choose their gender when ordering their dinner – just let them choose their toy instead. It’ll make for a happier Happy Meal and a better experience overall.